This easy-to-use study for small groups and individuals reveals the Bibles book of joy. 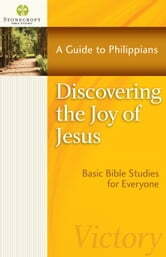 The apostle Pauls words in the book of Philippians share the secret of joy—a life centered in Jesus Christ. Open-ended discussion questions, Bible passages, and helpful explanations and applications point readers to the godly characteristic of joy, which is sharing in Gods life—a quality that transcends happiness based on circumstances. About This Series: Stonecroft Bible Studies encourage people to know God and grow in His love through exploration of His life-transforming Word, the Bible. Each book is designed for both seekers and new believers and includes easy-to-understand explanations and applications of Bible passages and study questions.